When people talk about an English military cut – the kind of thing that will make you feel like a soldier, stand up straight and give you an air of authority – this is what they mean. Although other Savile Row houses, such as Dege & Skinner, are similarly padded and sharp, Huntsman is the best known for this style. The structured, military style is most obvious in the shoulder line. 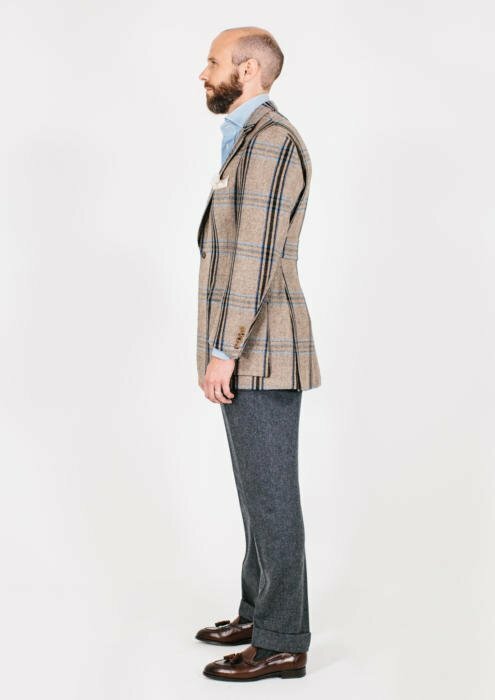 Although this tweed jacket (made for me in 2010) has a moderate pad at the end closest to the neck, it rapidly increases in thickness as it approaches the shoulder. This is done by adding extra wadding at the shoulder end (rather than, for example, using a thicker shoulder pad and stripping it down closer to the neck). The effect is to give me squarer shoulders than the rather sloping ones I have naturally. It creates an impression of strength, although as mentioned previously I generally prefer a wider shoulder to a thicker one as a means to achieve this look. Arguably, the cut is more suited to a business suit or tuxedo: something where the core aim is to make a strong impression. 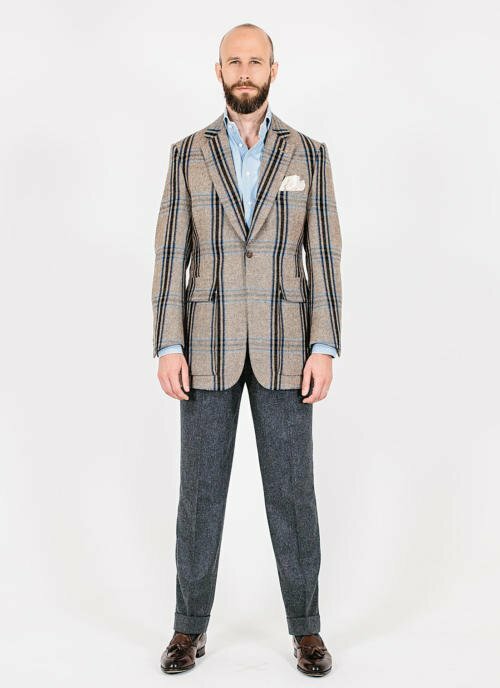 A tweed jacket would be more versatile in a soft cut from Italy, or in England in a drape cut from Anderson & Sheppard or Steven Hitchcock. It would then be a more suitable partner for jeans or cotton trousers. However, I still love wearing this jacket – it’s use is just a little narrower (similarly to my cotton Caraceni). I made many errors when I first started commissioning bespoke clothes. As one reader frequently comments, a benefit of this website is helping him avoid the same mistakes. Indeed I originally made this tweed into not only a jacket, but a waistcoat and plus-fours: a full shooting suit. The romance of it, particularly in a place like Huntsman, was overwhelming. So what else characterises this strong cut? Well the structure in the chest is pretty standard for Savile Row: three layers of canvas, horsehair and demette. But the jacket is long: 33 inches, compared to 31¼ from Anderson & Sheppard and 32¼ from Richard Anderson. This creates the impression of a long skirt – the bottom half of the jacket – given the relatively high buttoning point (18¼ inches from the neck, compared to 20 inches in both the other two). So a strong shoulder, short chest, and then a long skirt – the latter also accentuated by the classic-Huntsman single-button fastening. While most modern tailoring styles originate in British riding clothing, it is particularly easy to see those origins here. That single, high button would have made it much easier for the jacket to remain fastened when its wearer was on horseback. The jacket has a relatively wide shoulder for me, at 6½ inches, finishing in only subtle roping. The lapel is interesting. It is quite narrow (3⅜ inches), with a lot of belly at the bottom before straightening towards the top. That top comes relatively far down, with the gorge low at 4 inches from the shoulder seam. Overall, this means the lapel is a little short and stocky – the opposite of the straight lapels (which appear convex) favoured by Florentine tailors. It’s probably the style aspect of the jacket that I like least. I think the style as a sports jacket, by the way, works here because the trousers (grey flannel) are quite formal and cut high. They are actually taken from my Panico suit (review coming soon) and have an extra element of formality derived from their double, forward-facing pleats. The shirt is made in our Everyday Denim cloth (which rather suits the texture of both tweed jacket and flannel trouser) but has a high, cutaway collar that makes it a touch sharper. The shoes are my tasselled Belgravia loafers from Edward Green. The cream-cashmere handkerchief is from Anderson & Sheppard Haberdashery. Elsewhere in our style breakdown, the Huntsman jacket has a fairly standard sleeve – finishing in an 11-inch cuff – and a deep vent at 10½ inches. It is very waisted, coming in sharply just below my rib cage, and has a lot of shape through the lower back as well. The foreparts (below the waist button) are quite closed, and the outbreast pocket is lower than average at 10¾ inches from the shoulder. There is a little drape in the chest, but not much. Being a hunting jacket, it also has a few style details that can’t be compared to other jackets. These include large, square patch pockets, a half belt at the back, and an ‘action’ or bi-swing back. This uses a pleat on either side of the upper back to enable greater movement of the arms (in theory, to lift and swing one’s gun). As mentioned when I first had this jacket made, I had a few issues with the cutter David Ward (now no longer at Huntsman), particularly around the checks matching. But having discussed these with David recently, I think they were largely down to miscommunication. The cut elsewhere was very good. You can follow the discussion on Huntsman tweed jacket: Style breakdown by entering your email address in the box below. You will then receive an email every time a new comment is added. These will also contain a link to a page where you can stop the alerts, and remove all of your related data from the site. 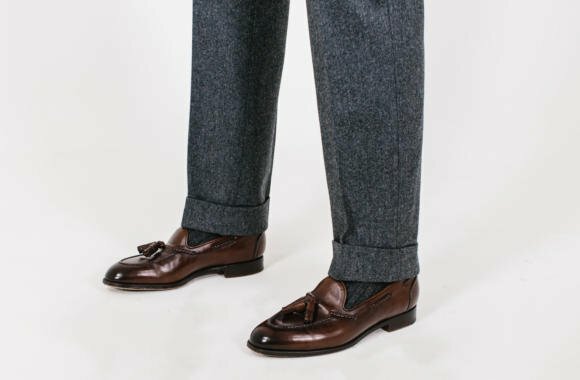 Are trouser knee and cuff measurements perhaps the wrong way round? The jacket is interesting. It has perhaps every aspect in cut that I generally dislike, but I nonetheless like it as an exception. Variety wins perhaps. Are the sleeves a touch short? Love the cut but the pattern is very loud. Perhaps a tiny bit. And yes, not for the faint-hearted! While I enjoy every aspect of that cut, I find it extremely hard to wear in daily life. This comes from my own experience with a jacket of similar cut. It is made from a lovely grey windowpane flannel which is rather stiff, making for a very dressed up, ‘soldier’ like look as you have just said. Even though I love that jacket, it has been sitting in my wardrobe for over a year, and I wonder whether there would really be a place for a jacket of such cut in one’s life. I know what you mean, hence my comment about sports jackets in general. Perhaps yours would be nice with charcoal worsted trousers, black slip-ons and a smart white shirt, open necked? Just pure enthusiasm at the idea – I thought I’d wear the jacket and waistcoat separately as well as together, and very occasionally the plus fours. Perhaps the biggest bespoke mistake I’ve made there – the jacket on its own would have been lovely. I admire your chutzpah for not only commissioning this suit in the first place but also for drawing it to our attention once again. I found this is the most enjoyable yet in this series, giving ‘style breakdown’ new meaning. I’m sure we can all tell at least one story of our own “style breakdowns”! I like what you have done. It is easy to get subtle and practical pieces over and over, but it is good to step out and get something different sometimes. A heavy, bold tweed is a joy to wear. The trick is to wear the bolder pieces, and not always reach for the safe choices. Too much sameness in a wardrobe becomes boring. Although the jacket might be bolder than a lot of your clothes, it doesn’t seem like it would be that difficult to wear. The key is attitude and keeping everything else plain. 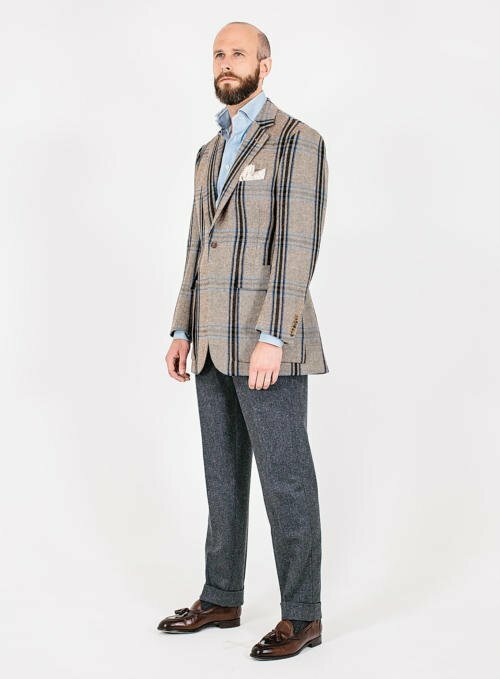 I agree 100% with Rogey; bold tweeds are a joy to wear, provided that one wears them unapologetically and with panache! Would they cut a suit jacket exactly like his (e.g., relatively high buttoning point , long skirt, slim lapel) or would some of these elements be more specific to a shooting jacket? Interesting analysis of a very interesting commission, Simon. The check is loud, but really works, I think. The length of the jacket and the flare of the skirt may be just a touch too much for me, but the overall impression is absolutely superb. You’ve written a lot about the drape cut, particularly A&S (and possibly W&S? ), but I find that this cut appeals a little more to me. I’ve recently had a bespoke suit with this cut which is superb and very comfortable, but I sometimes feel makes m upper body appear fuller than it really is and, consequently, out of balance. I’m 5′ 11″, with a 41″ chest and 35″ waist, so pretty much in proportion. I suspect that a Huntsman-type cut may give a more balanced appearance. Do you think that may be true or am I barking up the wrong tree? I’m not sure I’d say it’s more balanced Richard, but you certainly have a larger chest than me relative to height, so it may not be something you want to emphasise in quite the same way? Have you had a chance to blast a few cartridges with the coat on? Just wondering is it actually practical. No, sorry… I can turn around in sudden surprise though. Thanks, Simon. Anyone else you would suggest for a cut similar to Huntsman? Many thanks, Simon. I’m sure I speak for many readers when I say how much we value both the fascinating content of your blog and your generosity in giving advice. Much appreciated. Surely you wouldn’t wear a coat with bellows pockets and an action back to the pub? It’s a shooting jacket. Looking forward to the write up of the trousers; they look very good. I know you wouldn’t wear full country gear with this, but rather modernise, even so however I think that it is a bit OTT if not being used for its purpose. What are your thoughts on this? You would at the Crow. This one is particularly riotous. I love the trousers, shirt and shoes. My good friend and style advisor, Jason King, thinks the jacket would be better with the waistcoat and plus fours. He wants such an outfit to sport whilst riding his Penny Farthing. Perhaps this is the way forward for such a jacket ? Who is this David King you keep going on about? My companion and style sensei since 1971. His tastes are a little more outre than mine but normally after taking inspiration from both Simon and Jason, I succeed in doing the right thing. That cut is absolutely beautiful. Reminds one why nothing really beats Savile row, after all. Pattern is bold, yes, but I wish more of used dared to push things a bit further. “Pattern is bold, yes, but I wish more of used dared to push things a bit further.” I agree 100%! I’ve heard how you find this jacket the easiest to wear separately and wondered how you’d do it as it is very bold with the trousers! But this looks really nice how you’ve paired this with the grey flannel. I’ll have to have a hunt around the site to try and understand how this differs from the Neapolitan cut. I love Huntsman’s sharp cut. Unmistakably, it exudes even when applied to tweed! 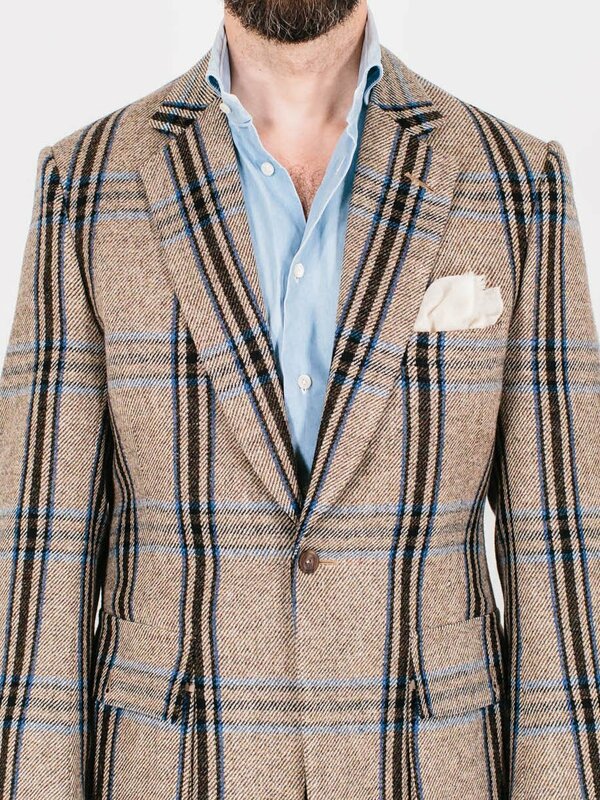 That said, I think this kind of jacket is rather suitable to cultural events such as The Tweed Run, where it could easily blend into the background. By the way, The Tweed Run as such deserves a post. Assuming that PS readers are all tweed lovers too – the contrary would be very very surprising ! – what could we learn from this event when it comes to craftsmanship seen from the perspectives of tailoring, designs and patterns that tweed as a fabric allows? I hope it makes to you and all PS readers. The one aspect of their jackets I would encourage them to consider is the front dart – especially with the beautiful large house checks – could they and would they use a smaller diagonal dart under the lapel and/or a dart a bit further back such that it’s not visible as it’s under the arm to get the necessary fullness in the chest without breaking up the plaid? Something I’d be interested to see discussed in a future entry to this series–or possibly its own article–would be how lapel width, gorge height, gorge angle, round, and belly work together and the effect they have on how one appears. I know you have done a “How Wide Should My Jacket Lapels Be?” article before, but that didn’t delve into these issues. Interesting point. We did cover it in ‘which house style suits your body shape’ and ‘flattering the tall and short’ Maybe leave a specific question there? I’ve read both those articles, but they don’t really touch on lapels much. “Flattering the Tall and the Short” only discusses the buttoning point and length of the lapel, with the briefest passing mention of gorge height and peak lapels. “Which House Style Suits your Body Shape” discusses shoulders in invaluable depth, but little else. 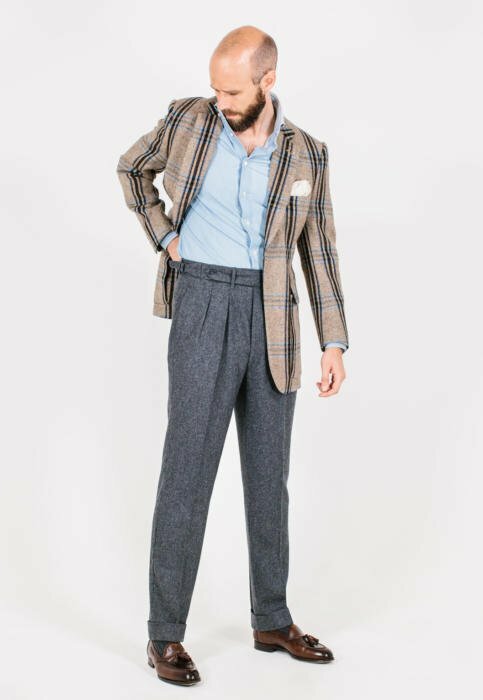 It’s actually an article like this, but instead focusing on all the style points around lapels instead of shoulders, that I’m thinking would be of great value. In the interim, I’ll maybe think of a focused question or two in one of those two articles. But I think there’s a valuable lengthier discussion that could be had here. The problem with loud patterns is that they dominate one’s perception of the piece. I’m taken by the pattern and the whole three-piece commission, but lost to my eye, one that pays particularly close attention to tailoring, is the finesse of Huntsman’ craft. (Quite fine indeed, as this post illustrates.) I suspect, then, a more economic house can achieve the same perceptual effect. I understand the romance of it all though. A bi-swing or action back is something I would get in most jackets if it was an option, freedom of movement in the arms is very comfortable in my experience. I actually like the trousers more than the jacket. Perhaps because I’m on the hunt to have some gray flannels commissioned for this fall/winter. All my trousers are cut similar…pleats, cuffs, side adjusters, etc. Who made this pair? A nice coat but the pattern is certainly aggressive! Any thoughts on Meyer & Mortimer? I don’t believe you’ve ever noted them before but I’m told their cut is very similar to that of Dege (and, by extension, Hunstman) at a (slightly) more moderate price. Is the lack of commentary on PS driven by past experience, or do you consider them competent and well regarded? It’s a beautiful jacket, a bit grand for me but you wear it well. Clearly there seemed to be a sticking point along the way regarding your communication when ordering it which you’ve cleared up elsewhere. 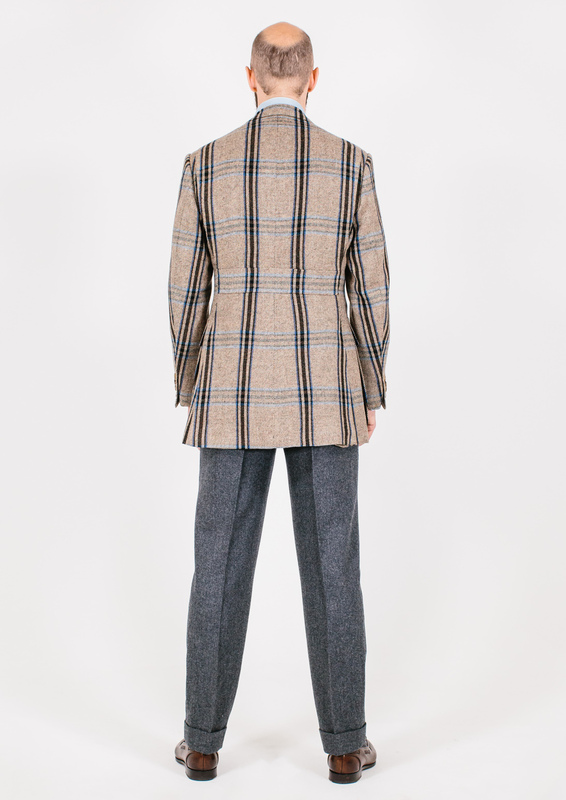 Irrespective of the style that some have reservations with, I commend your bold order as I think it’s a really beautiful piece, something that you just cannot get here in the US (unless you have a tailor in London). In spite of Mr Ward having, (as we like to say in the US) some balls, to challenge your comments in another post, his communication with you to define aspects of the garment from a tailors perspective was fascinating and educational from a readers perspective. I wish there was more of this in your website. However, your choice of words as a footnote to the above article lowers its finesse. Your remark that you “had a few issues with the cutter David Ward (now no longer at Huntsman)” is personal and unnecessary when you’ve reviewed a garment so favourably. As a former Huntsman client, l became exasperated, as others have by what’s happened at this once great company. Mr Ward’s leaving Huntsman, I’m told, was in the same vain as the other 30 or so staff who have also left the company due to its new owners, Messrs Lagrange and Roubi. I am also aware from colleagues that this exodus of staff is still happening. A revolving door of a companies workforce does not happen because they cherish the new boss. You’ve clearly enjoyed the ownership of the suit and have referenced your appreciation, so why not credit the craftsman with the relevant tone rather than using captious remarks? Ive used London solely for bespoke clothing for many years and the “trade”, that it is so lovingly referred to by its workers is clearly struggling, so why not endorse the few who do it well with credibility and flair. I’ve run the gauntlet of finding that goldie locks moment to acquire the best cutter for my needs and after many excursions, by far, Mr Ward came out on top. To witness you at times exalt some clearly average tailoring is an eye watering read when you unnecessarily nitpick one of Savile Rows true paragons. A confusing, yet well penned article. Thanks Morad. I did speak to David in advance of the article and he had no problem with the wording I used. I think your comments are also a little one-sided, given the very complimentary things I also said about David. I’m pleased you liked the piece. I noticed a jacket in Huntsman’s window last year in this cloth and noted how much presence it had. It certainly is a statement piece. I think it is all too easy to criticize work of this type but one thing is for sure when you wear it you will be noticed. How much do C&M and Richard Anderson charge for an entry level suit? For Richard Anderson, it’s on their Style Breakdown post. And Chittleborough are being added tomorrow…. 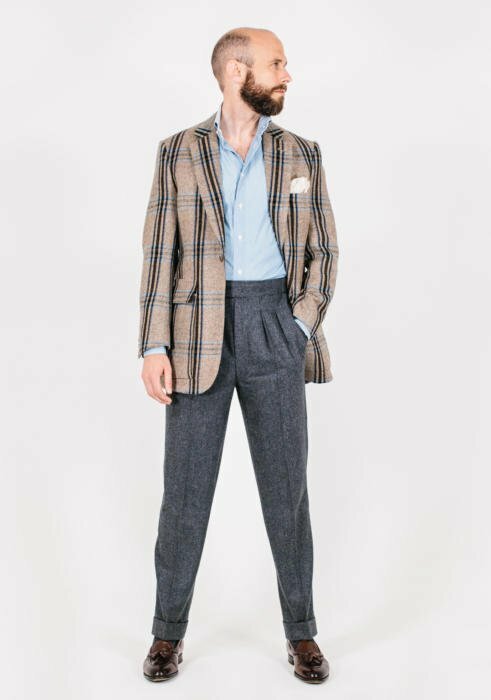 That particular tweed must be difficult to work with, matching the checks, but I’m kind of baffled as to why the cutter chose not to match the bold, brown (black?) vertical stripes along the chest and the sleeves. It’s more convincingly handled from the rear, and doubtless he had to work with the proportions, placement and spacings of the patterns in the torso, but I wonder why he chose that compromise in such a conspicuous area. Of course, I’m just a customer of bespoke garments and a casual reader, so hopefully I didn’t offend anyone terribly. I also own a bespoke Huntsman tweed coat and my cutter did say it always gives him a headache trying to match the patterns in the sleeves. Thanks for such a well-thought through and polite comment Dan. Hi Simon, a bit off topic, but do you have any view on Huntsman’s Bespoke 100 offering?